One day last week, a co-worker casually mentioned: “it’s been a while since you brought in cookies.” Well, that challenge did not go unheeded. Ask and you shall receive. With a three-day weekend approaching, I quickly flipped through some books to decide which baked goods should make the cut. 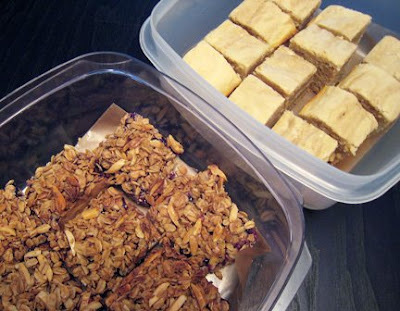 Since Martha Stewart's Cookies is still fresh and new on the shelf, and since I want to try pretty much every cookie in it, I picked two from it for this occasion: Blueberry Bonanza Bars and Cream Cheese Swirl Blondies. Also, in honor of one co-worker’s birthday, I made Caramel Topped Tea Cakes from Cupcakes! by Eleanor Klivans. I made a slight change in the execution of the cupcakes. 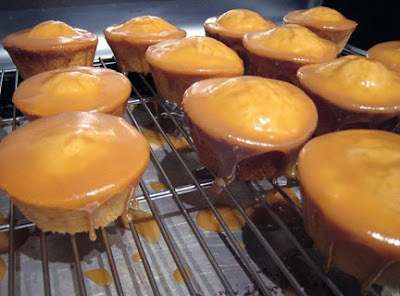 Instead of making mini-muffin sized cakes and dipping the bottoms in caramel so as to serve them upside down, I made regular-sized cupcakes and poured the caramel over the tops. The yellow cake batter with sour cream makes a yummy cupcake. The caramel sets into a slightly crunchy state like a praline. Next time I’ll top them with some pecans and a tiny sprinkle of sea salt. Why didn’t I think of that sooner? 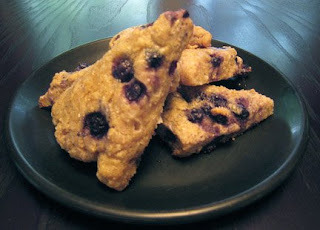 The granola topping for the Blueberry Bars yields a bit more than you need. After they’re cut, the topping that’s not stuck to the blueberry jam falls off, and they’re a little messy. I was worried that they were too sweet, but several people commented on their deliciousness. One person asked for the recipe. Naturally, Kurt sampled each item at home, and his favorite was the Blondie. The cream cheese mixture is very runny, so the swirl action was not as I expected. Also, it’s not very noticeable in the light colored batter. They are delicious though. One co-worker was certain she was tasting rum in them, but on further reflection she decided it was just really good vanilla. I used Central Market’s organic vanilla but no rum this time. The cookies and cupcakes disappeared quickly without a single complaint. -Place lime juice in a small saucepan and bring to a boil. Cook until reduced to 1/3 c. Remove from heat and let cool slightly. Place lime syrup, habanero (a little at first), and remaining ingredients in blender and blend until smooth. Add more habanero to taste. Believe it or not, I made this recipe without changing a single thing. Although, I never actually measure citrus zest so what I added was probably a little more than a teaspoon. 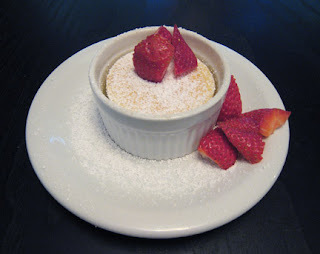 But, I used lemon, skim milk, and all the other suggested ingredients without any tinkering. So, the only newsworthy thing about this recipe is that it’s delicious. Definitely a keeper. The tops of my cakes didn’t brown in 37 minutes of baking, but the texture was right. They were cakey on top and puddingy on the bottom. Ok, maybe I did change one thing. The last line of the recipe reads: “serve warm or at room temperature,” but I enjoyed these chilled. The lemon pudding bottoms are especially refreshing and bright after sitting in the refrigerator for an hour or two. 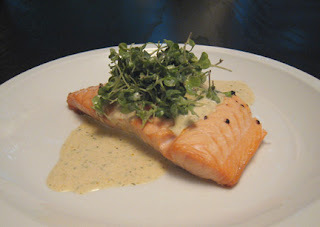 This recipe appeared in the June 07 issue of Food and Wine and was then included in their Best Recipes of 2007. It’s from Sara Kate Gillingham-Ryan and was adapted from The Greyston Bakery Cookbook. This means my Amazon wish list just got longer by one item. I just realized lemon seems to be a recurring flavor in my posts. I promise I'm not receiving any sort of kick-back from the lemon association of America. I had lemons on my tree which is always thrilling, but they're all gone now. I can move on to other fruits. 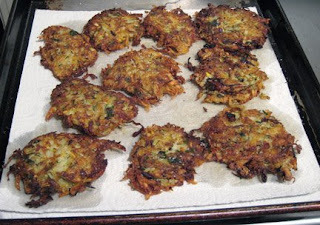 Fresh from the farm yesterday, my share included zucchini, potatoes, and onions which made me think of fritters. I’ve made potato latkes a million times, but I’d never tried any sort of vegetable combo. I think I once saw Sara Moulton making zucchini potato fritters, and I mentally filed that away for future use. Remember Cooking Live and the occasional market basket cook along? It was fun to watch her get flustered trying desperately to fill so many Food Network hours, but at least she can cook. I learned from her and have made several of her dishes. And, on one occasion, I think she made something like these fritters. It couldn’t be easier, but it is necessary to work quickly. The excess liquid needs to be squeezed out of the grated zucchini and potato, and the rest of the ingredients need to be mixed in before the potato sugars start oxidizing and changing color. I used eight ball zucchini, a baby yellow squash, a couple of small white potatoes, a red potato, some red onion, and an egg to bind. I also tossed in a little chopped parsley and garlic chives and fried them until crisp in canola oil. You really can’t go wrong with a fritter. These fresh, crunchy wonders were served with a small dollop of sour cream on top of each. On Saturday evening, I tried a couple of recipes from Mario’s latest, Italian Grill, with mixed results. 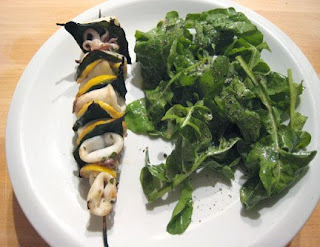 The Calamari Spiedini in Lemon Leaves looked delicious on the page, and I had Meyer lemons and leaves at the ready. In real life, it looked good, smelled good, tasted good, but the texture wasn’t perfect throughout. The problem could have been that some of the calamari tubes I purchased were thicker than others. Also, I may have packed too much onto each skewer thereby preventing good heat transfer to all the pieces stacked together. 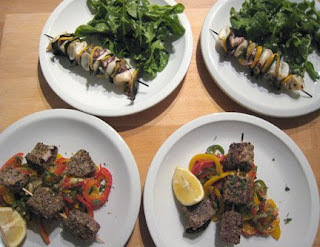 Some of the tube pieces could have used one more minute on the grill. The flavor was fantastic, and the texture of the thinner tubes and that of the tentacles was fine. I served this dish with a garden fresh arugula salad, and the peppery greens were a nice complement to the marinated squid. 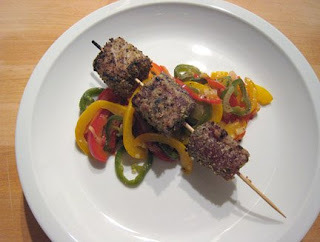 Up next was Charred Tuna Spiedini with Spicy Peppers. The spicy peppers included red and yellow bell peppers and jalapenos which were sautéed and then served as a bed for the tuna spiedini. Turns out the jalapenos were both large and piquant this weekend and managed to completely overpower all other flavors. The tuna was to have been dusted with a combination of fennel pollen and dried oregano and then seared briefly on the grill. First, Austin has no fennel pollen. Huge oversight, Austin! Second, to get a good char on the tuna, I really should have turned it in oil rather than just drizzling. While delicious itself, the tuna suffered from the very spicy, jalapeno-forward pepper mélange. Our conclusions were that while I quite enjoyed the marinated calamari and had less chewy pieces than Kurt did, Kurt was happier with the tuna but wished the pepper pile hadn’t disappointed so. This is a dish which really does not require a recipe. I’ve made it a thousand times, and I’m fairly certain that I’ve never made it the same way twice. Last weekend, the ingredients I had on hand included: chicken broth, canned diced tomato, red onion, carrots, eight ball zucchini, swiss chard, kale, canned red kidney beans, red potatoes, and bay, sage, thyme, and parsley from my herb garden. Since I had potatoes to use, I chose to leave out the usual pasta. The noteworthy experience came at the end of the cooking time. As I tasted the soup again and considered the flavor and seasoning, I first thought: more salt. Then, I realized: no, not salt, acid. In A Return to Cooking, Eric Ripert discussed balanced flavor and the use of acid, and this came to mind along with a quote from last week’s Top Chef. During the quick fire challenge, guest judge Art Smith said of the lime in a dish “chefs don’t think of using acid as often as they should.” Of course, vinegar or lemon juice added to a soup at the end of the cooking time will brighten the flavor, but when throwing things in a pot and doing five other things while waiting for the soup to cook it could slip one’s mind. 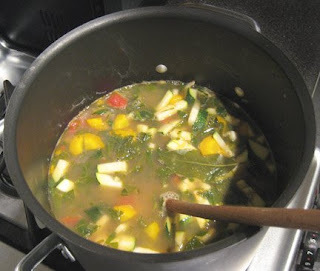 A tablespoon or two of sherry vinegar added to the five quarts or so of soup made this minestrone perfect, and henceforth I’ll remember to reach for acid to balance flavors. I received Avoca Tea Time as a lovely birthday gift in March (thanks Sharon and Bill!) and finally baked some scones this past weekend. After pulling out my copy of Food Lover’s Companion and doing some quick conversions, I mostly followed the recipe for Scones with Sultanas and Cranberries. Sadly, my supply of raisins included about a tablespoonful and I forgot to buy dried cranberries, but I had frozen blueberries. Hence, the title you see above. These were devoured hot out of the oven with a cappuccino on Sunday morning. Now, I’m thinking seriously about acquiring a kitchen scale. Ruhlman discussed the topic recently. The measurements would have been more accurate and much easier to achieve. This salad was inspired by a dish enjoyed last year at Asti Trattoria. It's a very simple combination of just a few ingredients. Asti presented thinly sliced, spring zucchini with goat cheese and mint splashed with a few drops of lemon juice and drizzled with olive oil. 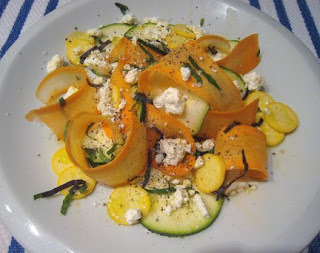 After collecting our CSA share last night, I had gorgeous carrots, zucchini, and one baby yellow squash, and they all found their way into this salad. I sprinkled on a chiffonade of purple and genovese basil along with the mint. Some black pepper and a pinch of sea salt were the only other ingredients.